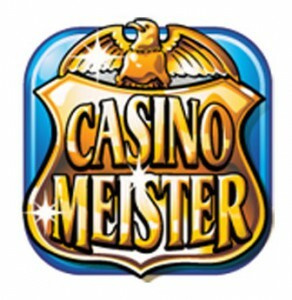 The Casinomeister is an important brand that is very popular among the online casino gambling industry, as it’s one important forum that has been around since 1998 and run by Bryan Bailey. The online slot machine with the same name will be able to stand for this name and provide youwith an unforgettable online gambling experience. 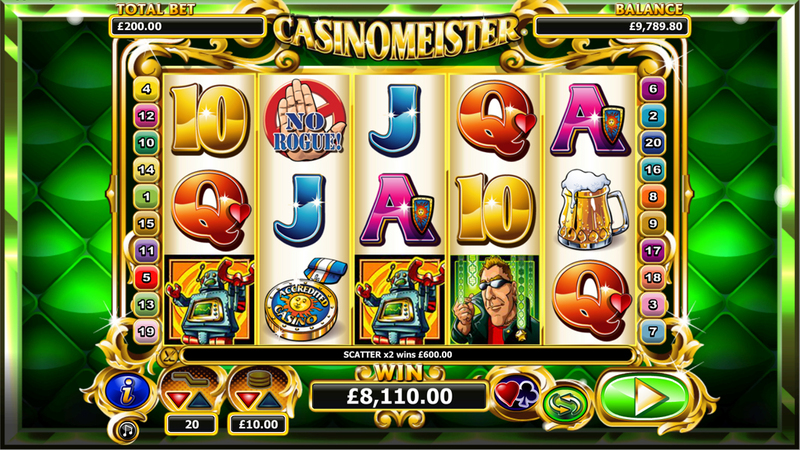 The Casinomeister slot machine has 5 reels and you are given the nice opportunity to activate up to 20 pay-lines. One of the things that makes this video slot machine really exciting is the fact that there is a huge jackpot that is worth $100,000. The coin denomination for this Casinomeister slot machine are: $0.01, $0.02, $0.05, $0.10, $0.20, $0.25, $0.50, $1.00 and $2.00. There are all sorts of special symbols available and you can find a wild symbol that comes attached with a 2x multiplier symbol which will double your winnings. The wild symbol is represented by Bryan Bailey and they can substitute any symbol you need in order to get those winning combination of symbols, except for the scatter symbol and the two Rogue symbols. 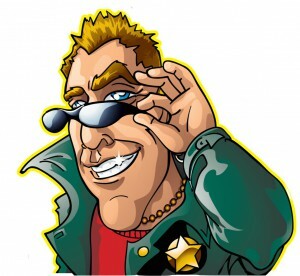 You can also start the fun as you trigger the free spins round. All you need is 3 scatter symbols and you will get to spin the reels for free and keep the winnings. The scatter symbol is the Votran Robot. Along with the free plays that you can get when you get this symbol, there is also a nice payout attached to these symbols. The payout is going to start from 1x the bet you’ve placed for two scatters and it goes up to 100x your bet size in case you get 5 scatters on an active pay-line. 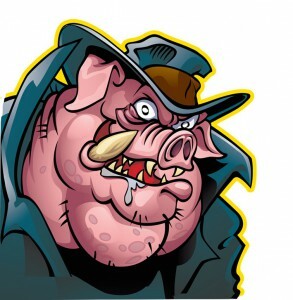 Another symbol that can appear during the free spins round is the “Rogue Behind Bars”. This symbol will mean that the free spins are not ending and new plays will be awarded to you. This is considered to be one of the best features available. If you take a look at the information available about this free spins bonus round you can notice that they claim to have an Unlimited free spins round. There isn’t an unlimited number of free spins, however this feature will get retriggered a lot. So even if the free spins are not unlimited, it will certainly feel like they are. During our tests, we managed to notice the fact that the free spins were triggered up to 30 times. Every time you manage to trigger this feature all the winnings will be multiplied by 3 thanks to a 3x multiplier that comes attached. The Casinomeister NextGen slot machine is one of those low variance game. This means that you will get the opportunity to get many wins, but they will hold a rather small value.